Here you will discover the complete meaning behind the mirror hour 23:23. For this we use the works of Doreen Virtue which will allow us to provide you with an interpretation of this double hour using the guardian angels. We also use numerology and the Tarot of Marseilles to try to give you as many pieces of the puzzle as possible. After that it is up to you to consider for yourself the many different elements that you have read. You will then be able to determine what message the hour 23:23 has sent to you. When we observe a synchronicity, it often speaks to us only as individuals. This is completely normal! Your subconscious has made sure that you look at the clock at this exact time of day. Its goal is to successfully deliver a message to your conscious mind. However we need to know how to interpret it, and this is not necessarily something that everyone can do. Here you will benefit from our expertise in the field of angelology which will give you the keys to understanding these double hours. Here you are getting a message on behalf of the guardian angels concerning a project which is very dear to your heart. The angels are giving you clear indication that they are beside you and will help you make this project a reality. You can rest assured that if you have an idea of something you want to carry out in your romantic or professional life then your actions will be met with success. The hour 23:23 also means that you are subject to movement. Get ready to go on a journey! This could be to do with business, but take the time to look within yourself because the move may also be to do with your personal life; it is up to you to determine the nature of this movement. The angels will help you to become a flexible person with an open mind. You have the ability to adapt to all kinds of situations which is very impressive! You certainly have an innate gift for communicating your ideas with those around you, all while having a great capacity to listen as well. This makes you a good intermediary that people can trust with great secrets! 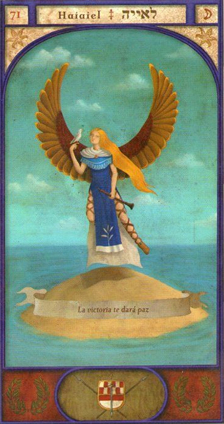 At this moment you are benefiting from substantial protection on behalf of the angelic world. The angels are guiding you in your spiritual development so make good use of this armor of light to progress in your life with serenity. You have the ability to reach your lofty objectives. All you need to do is set out on the life path which is right for you. This may require changes in your habits, but these will do you a lot of good! The guardian angel corresponding with 23:23 is Haiaiel whose influence extends from 23:20 to 23:40. He is a symbol of reassurance and boldness. He gives you an advantage over your potential adversaries. He surrounds you with his protection to allow for peace and harmony to replace conflict in your life. Haiaiel will help you to bring your life projects to reality. He gives you a rounded view of your abilities which will allow you to measure your impact upon others with care. Call upon him if you are in a period of stress or anxiety and he will bring you comfort. What does 23:23 mean in Numerology? 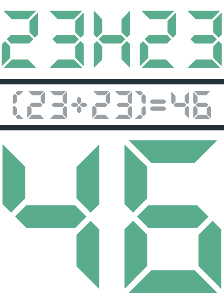 The total value of the mirror hour 23:23 is 46. This number shows a high level of independence. You like freedom to act, but more than this, you like freedom to choose! Be wary of anyone who would want to impose their views on you. You have strong opinions about free will and you are a symbol of integrity. You are going to experience a positive development in your professional life. You have an impressive ability to concentrate and the way you do your work brings you results which often surpass the aims set beforehand. Your desire to explore new areas of knowledge gives you a definite advantage. But this success can quickly be compromised if you don’t manage to find your balance on the emotional level. Your romantic life seems complicated and this sometimes has a negative impact on the other areas of your life. You should avoid making the same mistakes in love again at any cost, otherwise you may have to suffer a blow to your mental wellbeing. You are a sensitive person and you think that you can help everyone! Indeed, you have a lot of potential to heal those souls in need, but you definitely shouldn’t take on the misery of everyone you meet. Continue to look after your family and the people who make up your home. Once you have found stability, you will be able to take part in the enlightenment of a great number of people without risking your own wellbeing. Any comment on the 23:23 mirror hour? I am a wellness pathfinder and these words and number combination makes perfect sense! Thank you…these interpretations are truly amazing. Is there any reason that there is no tarot card associated with this? What you say makes perfect sense re my personality and how I act. Yes! I’m glad I took upon the message to come here! I know what it has got for me! I can never thank you enough! I’m happy, really happy that you all people are working for such needed guidance for souls like us! Thank you! This is keeping me alive it allows me to live every day I am guided because of it. Thank You for making a difference bringing this information to the world . Do you have an IOs app I could down load mirror hour on.